By contributing writer, Jim Cobb. Getting lost in the wilderness can be dangerous, not to mention frightening. 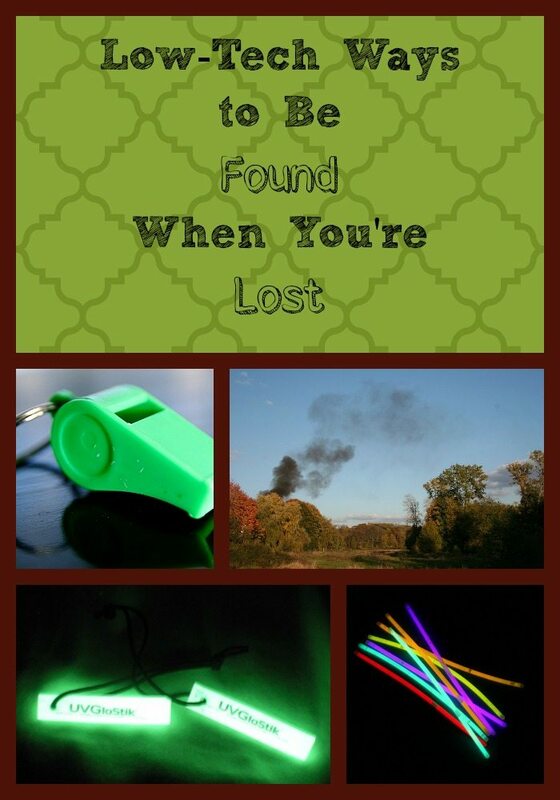 Search and rescue teams are trained how to track people, of course, but you can do them a big favor by carrying with you just a few simple tools to use to signal for help. Using these items will help get you home much sooner. Naturally, if you have a cell phone with you, that should be the first thing you grab. Remember, even if you don’t have enough of a signal to place a call, sometimes text messages will still get through. It never hurts to try. But, don’t rely only upon the much-vaunted smartphone to get you out of this jam. Even Siri, in her infinite wisdom, may be ineffective. One of the smallest signal tools is a simple whistle. It can be carried in a pocket but I suggest looping it around your neck on a lanyard, preferably using paracord. This serves to keep the whistle on your person, no matter what. Plus, paracord is extremely useful for a variety of tasks. There are two basic types of whistles, those with peas and those without. If at all possible, carry the pea-less variety. In extreme cold, the moisture in your breath could freeze inside the whistle, causing the pea to stick inside the whistle and rending the whole thing useless. It is also due to the possibility of cold conditions I suggest the whistle be plastic rather than metal. Remember that scene in A Christmas Story where the kid sticks his tongue to the flag pole? When using the whistle to bring help, blow three short blasts at regular intervals. This is the standard rescue signal. The sound of the whistle will be heard at far longer distances than that of your shouts. Plus, you won’t get a sore throat from blowing a whistle. All of my children are equipped with a whistle when we embark on a hike, just in case. A signal mirror is a common item found in many prepackaged survival kits and for good reason. Used properly, the reflected light can be seen for miles. The downside of this tool, though, is it requires sunlight so it is useless at night or in very low light conditions. You can improvise a signal mirror with a compact disc, if need be. To use a signal mirror, you hold it in one hand and raise your other hand up, making a V shape with your fingers. Look through the hole in the middle of the signal mirror and slowly rotate around until you see a spot of light appear on your outstretched hand. Angle the mirror and that hand up until that spot of light reaches through your raised fingers. Continue looking through the mirror’s sighting hole aim toward your target, such as a plane overhead. Waggle the mirror slightly up and down to create flashes and call attention to your location. Another signal tool that uses light is a cyalume light stick, sometimes called snap lights. You can find these in dollar stores and toy departments just about everywhere, especially around Halloween. They are thin plastic cylinders you bend and shake, mixing the chemicals inside until they begin to glow. To signal for help with one, tie it to a length of cord about two long. Then, twirl the cord in front of you, creating a large circle of light. While you’ll need to be in a cleared area so it can be seen, it is far safer than trying to get a signal fire lit quickly. Another inexpensive product on the market is the UVPaqlite. Speaking of signal fires, they aren’t a bad plan, provided you don’t let them get out of control. For use during the day, you want to burn a lot of green wood and leaves so as to create smoke. The smoke is what will be seen during daylight hours. At night, go the opposite route and burn dry wood that will cause big, bright flames. If you believe there may well be search planes or other aircraft looking for you, find a clear area and build three fires in either a line or a triangle. This is a common distress signal. Of course, if the clear area is large enough, you could spell out HELP with rocks or tracks in the snow. Now, all these various methods of signaling for help are at least somewhat contingent upon people looking for you in the first place. It is vitally important that before any hiking or camping trip you let someone know when you’re leaving, where you are going, and when you plan to return. Be sure to instruct them that if they do not hear from you by a specific date and time, they should alert the authorities that you may be missing. Naturally, in order to avoid embarrassment, don’t forget to keep your end of the bargain and let them know you’re home safe and on schedule. Please note; People who are disabled and/or who can not blow a whistle should be shown how to swing /spin the whistle quickly to force air thro the device without using your mouth – lungs …To make the signal it would not be the three long three short blast ( SOS )but a one long waving of a whistle tone … an extra Boot or SHOE LACES tied to make whistle longer to swing over head for Louder tone . People wander off into the bush in Australia all the time and get lost, which baffles me. You can live without food for weeks, but water you need every day or so. Our towns and villages are all on water courses, this is true of almost every civilization, it seems to me if you got lost anywhere the best strategy would be to keep walking down hill until you found a water course and follow the water course until you found a town, it’s almost certain you would find a town unless you are in Alaska or Siberia. You put yourself next to a water supply to drink, increase the odds of finding food. Why wait for rescue, rescue yourself.